Quirky, drum-machine-based pop music from outer space, here is sci-fi put to music, an eerily weird, suspense-filled journey of the subconscious, creating soundscapes of odd, but intriguing proportions. 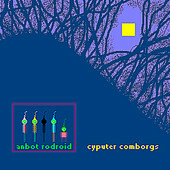 Cyputer Comborgs, the latest from Salem, Oregon's Anbot Rodroid, is hard to understand, but not in a complex way. It's snyth-laced sounds and smiling, happy-go-lucky position finds it hard to listen to this record and be in a bad mood. Still, the general characteristics of this all-over-the-map, beauty-in-its-flaw sound makes it a hard one to swallow. But, that seems to be the band's strongest point, creating an album - and a sound - that is laughable at first, but grows on you, sometimes even in an annoying way, the more you listen to it. But, despite all that, or maybe because of it, it has an addictive, "what's happening next?" quality to it. I'll give it a C-.